Intelligent Weighing Technology, Inc. is a wholesale master distributor and value added integrator for weighing products and components. Intelligent Weighing Technology supplies a complete range of high-quality laboratory balances, industrial scales, load cells and weighing accessories to the North American market. Its leadership team has more than 65 years of experience in the weighing and measurement business, both in the USA and worldwide. Intelligent Weighing Technology is the exclusive distributor in North America and the Caribbean for Precisa®, Sartorius Miras®2 and UWE products. We are the exclusive source for all Intelligent-Lab™, Pure-Sample™, Intelligent-Industrial™, Cal-Quick™, Cal-QR™, Intelligent-Check™, Intelligent-Count™, Fast-Count™, Intelligent-Weigh™, Intelligent-Base™, Intelligent-Scan™, Titan™, Intelligent-Lift™ and Intelligent-Print™ trademarked products and processes throughout the world. With its 8,000 square foot facility located in Camarillo, CA, Intelligent Weighing Technology offers a high level of product inventory for faster shipping. But we don't just ship product. Every balance that leaves this building has been checked out and calibrated by our expert staff to make sure you get the best product available. Built on a cornerstone of quality, precision, and service, Intelligent Weighing Technology provides you with the equipment you need, right on time. The LF Analytical laboratory balance is produced in Japan in one of the cleanest facilities you will ever see. The quality of workmanship and attention to detail is superb. Starting at the bottom of the balance, there are three support points, two of which are adjustable to provide leveling. The AJ Series of balances is produced in Japan with great quality of workmanship. Starting at the bottom of the balance, there are three support points, which provide leveling. The base contains the revolutionary Vibra double ended tuning fork sensor, which gives almost instant start up with no warm up time. The Vibra module is also very resilient against shipping or any movement induced damage. Accurate weighing data is attained on a 4.65 diam.stainless steel platter. 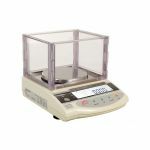 The centigram (0.001 g) range is fast, accurate and suitable for many different applications in the laboratory, including density determination, counting, percentage weighing, accumulation and check weighing. The AJ Series of balances is produced in Japan with great quality of workmanship. Starting at the bottom of the balance, there are three support points, which provide leveling. The base contains the revolutionary Vibra double ended tuning fork sensor, which gives almost instant start up with no warm up time. The Vibra module is also very resilient against shipping or any movement induced damage. 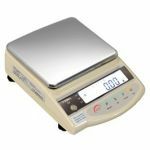 Accurate weighing data is attained on a 7.1" x 6.3"stainless steel platter. 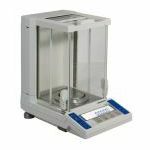 The centigram (0.01 g) range is fast, accurate and suitable for many different applications in the laboratory, including density determination, counting, percentage weighing, accumulation and check weighing.